UCubed needs your help in collecting 5,000 signatures for its new online petition to send Congress a lump of coal for the upcoming holiday. Extended unemployment benefits lapse on December 31st for millions of jobless Americans. Economists predict over 2 million jobless will lose their benefits by January. Another 1.3 million will receive their last check by February. 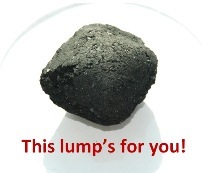 Send your members of Congress a lump of charcoal by signing UCubed’s petition here.